Heat oven to 350°F. 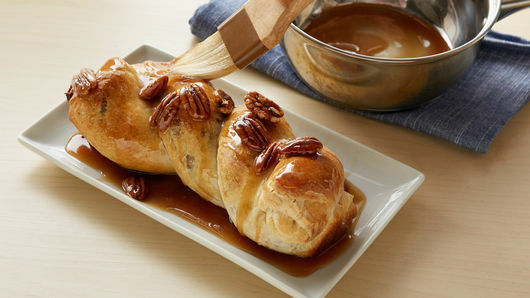 Spray 9x5-inch loaf pan with cooking spray; line with cooking parchment paper, extending up and over sides. In small microwavable bowl, microwave cherries and water uncovered on High 1 minute. Let stand 5 minutes. Drain cherries, reserving 1 teaspoon cherry juice in small bowl. Place cherries on paper towel; pat dry. Chop half of the pecan halves; set aside. Reserve remaining pecan halves for topping. In small microwavable bowl, microwave 1 tablespoon of the butter uncovered on High 15 to 20 seconds or until melted. Add 1/4 cup of the powdered sugar and the cinnamon; stir until smooth. Set aside. Carefully unroll dough onto work surface. 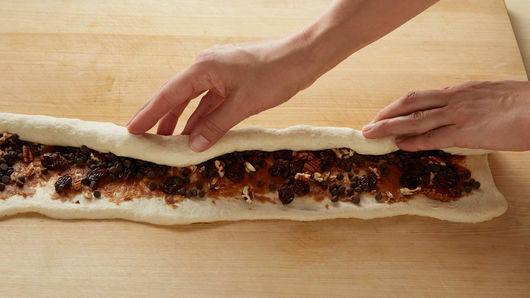 Fold dough in half, bringing long sides together. Press or roll dough to 18x6-inch rectangle. Spoon and spread powdered sugar mixture over dough to within 1/2-inch of edges. 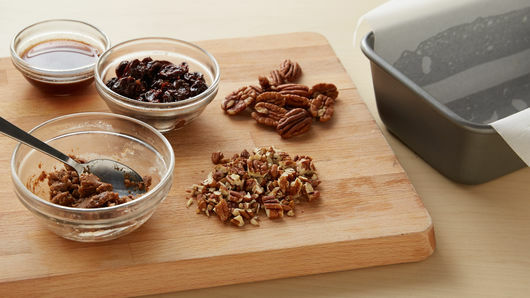 Sprinkle with cherries, chopped pecans and chocolate chips. Starting with longest side, roll dough tightly into log; seal edges. Cut log in half crosswise. Carefully braid pieces together; seal edges. Place braided loaf, seam side down, in pan. Bake 34 to 38 minutes or until golden brown. Carefully lift loaf from pan using sides of cooking parchment paper; place on cooling rack. Cool 10 minutes. Meanwhile, in 1-quart saucepan, mix remaining 1/2 cup powdered sugar, remaining 1 1/2 tablespoons butter, the reserved cherry water and the honey. Heat to boiling over medium heat, stirring frequently. Stir in reserved pecan halves; remove from heat. Place loaf on serving platter. Spoon and spread honey mixture over top and sides of loaf. I remember the wonderful smells of bread baking that came from Grandma’s kitchen. Sometimes it was filled with smells of cinnamon bread, raisin bread, apricot bread or, of course, her chocolate bread. It made any day special. I always wanted to be able to make some of Grandma’s special breads, twisted into beautiful shapes. When I became a teenager, I remember asking my mom if it was hard to make a yeast bread. She just smiled and told me it took lots of practice to really bake yeast bread. That night after everyone was in bed, I came down to the kitchen and found a Pillsbury™ cookbook containing bread recipes. Mom was right—it took me almost all night to make that bread, but I did it. Of course, everyone in the family was surprised to find my puffy little bread sitting on the table in the morning. I really felt so proud that I was finally a bread baker too. 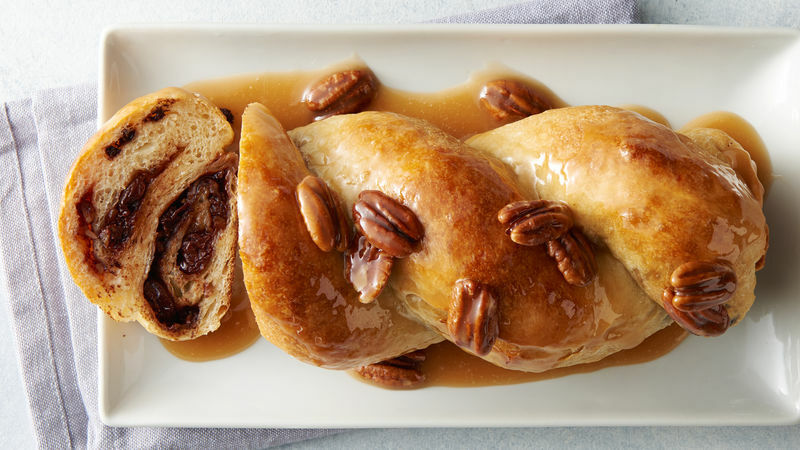 When I thought about entering the Pillsbury Bake-Off® Contest, I recalled my Grandma’s babka breads twirled with delicious fillings. I decided to shortcut the dough when I found Pillsbury™ French bread at the store. This made bread baking easy, so I just mixed up some chocolate-cherry filling to swirl around inside. There was no rising and waiting, and it was finished in just 35 minutes in the oven. I spooned some honey topping over it and added pecans for crunch. It was just like Grandma’s breads, only easier. I bet Grandma would be proud of me.